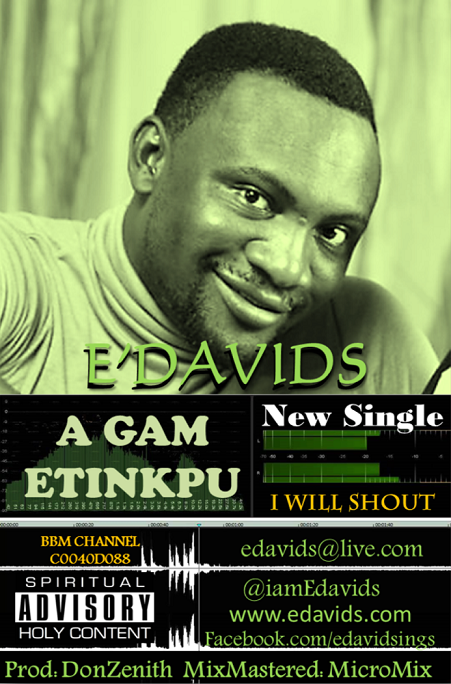 Gospel music minister, E’Davids (@iamEdavids) has geared up in Spirit and in truth to release to the Christian community and every other human on earth a song in Ibo dialect titled “A Gam e Tinkpu” which means “I Will Shout” when translated to English language. This song talks about being bold enough to shout in thanksgiving and praises to God for the things He (GOD) has done for us, not minding time, place and status. The song is one that carries God’s presence and guarantees you a dance, a grateful heart and a blessing. This song set to hit the media on the 1st of July 2015 was produced by Don Zenith (@mrzeneth), a prolific music producer, sound/concert engineer, and also mixed at MicroMix which is owned by the same person. This song is not just for the Christian community alone but for all those who appreciate the works and wonders of God in their lives. Enough has been said already, just click on the download button and get dancing, praising and SHOUTING!